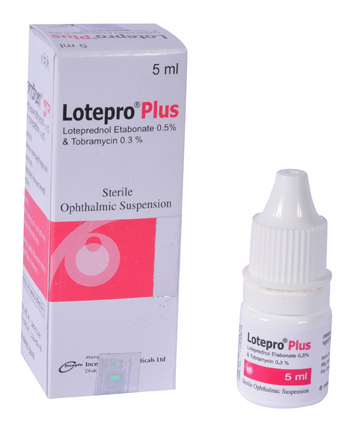 Lotepro Plus Sterile Ophthalmic Suspension: Each ml contains Loteprednol Etabonate INN 5 mg and Tobramycin USP 3 mg.
Lotepro plus is a sterile, multiple dose topical anti-inflammatory corticosteroid, Loteprednol Etabonate and antibiotic, Tobramycin combination for ophthalmic use. Loteprednol etabonate is a topical anti-inflammatory corticosteroid for ophthalmic use. Loteprednol etabonate is structurally similar to other corticosteroids. It is highly lipid soluble which enhances its penetration into cells. Lotepro plus is indicated for steroid-responsive inflammatory ocular conditions for which a corticosteroid is indicated and where superficial bacterial ocular infection or a risk of bacterial ocular infection exists. Apply 1 or 2 drops of Lotepro plus into the conjunctival sac of the affected eye(s) every 4 to 6 hours. During the initial 24 to 48 hours, the dosing may be increased, to every 1 to 2 hours. Frequency should be decreased gradually as warranted by improvement in clinical signs. Care should be taken not to discontinue therapy prematurely. Prolonged use may increase: IOP, which may be associated with possible development of glaucoma and infrequent optic nerve damage; posterior sub-capsular cataract formation and perforation of the globe where there is thinning of the cornea or sclera. The most frequent adverse reactions to topical tobramycin are hypersensitivity and localized ocular toxicity, including lid itching and swelling and conjunctival erythema. • If super infection occurs, appropriate therapy should be initiated. Pregnancy : Pregnancy Category C. There are no adequate and well controlled studies in pregnant women. It should be used during pregnancy only if the potential benefit justifies the potential risk to the fetus. Lactation : It is not known whether topical ophthalmic administration of corticosteroids could result in sufficient systemic absorption to produce detectable quantities in human milk. Caution should be exercised when it is administered to a nursing woman.